First Flavor Philadelphia, Age 24 Talk about experiential advertising. Aziz, a graduate of the University of Pennsylvania with a double major in bioengineering and political science, was watching Willy Wonka and the Chocolate Factory and was struck by the scene where the kids licked wallpaper that tasted like fruit. “I thought maybe you could actually do that,” says Aziz. Turns out you can. His company, First Flavor, developed the technology to manufacture small soluble flavor strips and filed a patent in 2005. Advertisers will soon be able to offer prospective customers sample sachets for products like flavored vodka, soda, and candy. Aziz’s concept is similar to perfume ads in magazines but his strips can also reach consumers via direct mail and point-of-sale dispensers. Also, Aziz expects some manufacturers to affix Peel ‘n Taste™ packets directly to their packaging to cross-promote products and brands. First Flavor is in talks with a number of consumer products companies and the first wave of strips could hit the market by January, 2007. Joshua Boltuch, Elias Roman Amie Street Providence, R.I., 22 Another way to market and sell independent music? Amie Street, an onliNe music retail site for independent content, uses a unique rating system where all songs are available for free at first. Then, depending on how popular a song is within a market, it goes up in price. The site tries to engage users by giving them a set number of recommendations and rewards them with a set amount of free music they can download when their recommendations do well. “We try to turn every user into a talent scout,” says Elliott Breece, co-founder. The Amie Street guys keep 30% of each sale, giving 70% back to the artists. MyCarScout Chicago, Age: 25 After graduating from Ohio State University, Chuck Branding received an intriguing business proposition from one of his father’s friends: Find him a good lease on a red limited-edition Jeep Liberty and put half the amount he saved in his pocket. Not only did Branding deliver, he enjoyed the car hunt so much that he made it his business. Through Business Network International, a referral organization, he met branding guru Bob Killian, who helped him come up with the name MyCarScout, a logo, and other advice for consulting fees of around $10,000. Branding charges customers either a flat fee of $450 or half the amount saved from each car he tracks down. He says the majority of clients are business professionals who don’t want to spend time searching for a specific car, but a good 15% of business comes from single women who are intimidated by car dealers. While MyCarScout is limited to him in Chicago and two employees in Miami and Denver—and 2005 revenues totaled only about $25,000—Branding says he may acquire venture capital and expand into new metropolitan markets such as New York City, Washington, Los Angeles, and Seattle, though no firm plans are in place. www.comcate.com San Francisco, Age: 18 When Ben Casnocha was 12, Apple Computer’s “Think Different” ad campaign inspired him to become an entrepreneur, he wanted to change the world on his own terms. In 2001, after a string of ventures, including selling gumballs to his brothers, he started Comcate, a software company that focuses exclusively on improving operations for public agencies. So far, more than 50 small and mid-sized government agencies around the country have hired the company and installed its Web-based software to improve customer service and office efficiency. Casnocha says Comcast is now focused on one thing: growth. He plans to have Comcast in more than 300 agencies by 2010 and predicts revenues will grow from close to $1 million now to $6 million by then. And there’s more to his story. He graduated from high school in June, and he’s already got a book coming out. My Start-Up Life: What a (Very) Young CEO Learned on His Journey Through Silicon Valley (John Wiley & Sons) is due in stores in May. www.metrohorse.com , Hackensack, N.J. Ages: 25 and 24 While working as Wall St. financial advisors during 2005, fellow Pace University graduates Vitaly Feldman and Alexander Koretsky daydreamed about starting a business together that would improve the process of searching for a reliable plumber, taxi service, or virtually any other service provider. Launched in June, 2006, the MetroHorse Website gives users an alternative to thumbing through the phonebook, relying on businesses and consumers to trade information, with businesses posting profiles detailing their services and consumers bidding for a particular service and adding feedback about it, which any user can access. MetroHorse generates most of its revenue from paid search placement, where businesses pay to have search results on the site list their profiles in front of others. Koretsky forecasts revenues of $500,000 in its first year. www.polaristar.com New Haven, Conn. Age: 21 Brad Galiette is just like any other small business owner, except he runs his $1 million company, Polaristar, which he founded in 2003, from his dorm room at Yale, where he is a junior, double majoring in economics and computer science. Polaristar sells online advertising infrastructure, marketing, and hosting services mostly directed at small businesses. “It does get pretty busy, I must say. But the great thing is that most of what we offer is automated,” says Galiette. Galiette has one full-time partner, and two or three part-timers at any given time. He reinvests most of the profits to grow new areas of the business. Polaristar is organized into seven business units, several of which are slated to release products in 2007. TagTarget, for instance, will offer consumers the ability to compare product prices both at online merchants as well as at brick-and-mortars in their vicinity. North Merchant will offer a suite of tools enabling businesses to safely accept credit- and debit card payments as well as electronic checks. Looking to ace the SAT but don’t want to hire a coach? Karan Goel, Avichal Garg, and Joe Jewell have created an online SAT preparation course that does just that. Though online tutoring is an optional part of the service, it starts with a diagnostic test to create a customized lesson plan, then uses artificial intelligence to adapt to each customer’s strengths and weaknesses, automatically adjusting the types of questions asked based on the taker’s answers. The best part of the course, which generally takes between three and four months to complete, is its efficiency, say the founders, because it eliminates needlessly repetitive exercises by constantly updating to focus on areas that really need improvement. The founders of PrepMe are serious brainiacs. Goel, CEO, is a University of Chicago MBA grad. Garg, the chief technical officer, holds degrees from Stanford in computer science and management and is also a product manager at Google. Jewell, who heads up curriculum development and content creation, got his degree in Aeronautical Engineering at Caltech with an M.S. in Aeronautical Engineering at the University of Michigan and is finishing a Rhodes Scholarship at Oxford. To further allay any doubts about their credentials, the three won the University of Chicago New Venture Challenge, a business plan contest, in May, 2005. Even though only about 1,000 students have used the service since PrepMe launched in early 2005, the guys are keen to take on heavyweight competitors Princeton Review and Kaplan in an industry worth $730 million. In fact, the tough competition is one of the most exciting parts about building the business for the founders. “That’s what makes it fun,” says Goel. www.gomobo.com New York, Delaware, South Africa Age: 25 Before he finished his political science degree at Yale, Noah Glass had already worked at Shutterfly, Amnesty International, Braun Consulting, and been accepted to Harvard Business School. But he deferred admission to pursue an opportunity at Endeavor, a non-profit organization supporting high-growth entrepreneurs in developing countries. After interviewing more than 150 entrepreneurs in South Africa, Glass found that the entrepreneurial bug had bit him, too. Tired of waiting in long lines for coffee in his hometown of New York City—and assuming that others felt the same way—Glass invented Mobo, a mobile ordering system where customers order and pay for takeout meals from restaurants on their cell phones. The service, which launched in June, 2005, alerts users with text messages when their meals are ready, and is quickly catching on, neighborhood by Manhattan neighborhood. So far, Glass says restaurants that use the service report an upsurge in business, since it saves them time by improving kitchen efficiency and gets people in and out faster, reducing lines. Restaurants pay Mobo 10% of each sale generated through the service. And although the service is easily scalable, Glass says he’s trying to grow relatively slowly—New York this year and into Boston, Chicago, Philadelphia, Washington, Los Angeles, San Francisco, and London by the end of 2007. But Glass isn’t just interested in food. He says Mobo could extend into movie-ticket ordering and parking-meter payments, for starters. Eventually, Glass visualizes a GPS-aided taxi service that customers can preorder, forgoing waits and rainy-night frustration. Until then, the company is poised for serious growth, with 2007 revenues expected to top $1.8 million. Darren Herman holds what advertisers dream about: the attention of 150 million consumers worldwide, a majority of whom are 15- to 35-year-old males. In March, 2004, Herman combined his childhood passion—video games—with his professional savvy—marketing—when he founded IGA Worldwide, an in-game advertising network. Though ads have worked their way into video game titles as far back as 1988’s Bases Loaded for the Nintendo Entertainment System, says Herman, the lack of a complete serving solution made it hard for advertisers to get the timing and context right for their in-game campaigns. In little time IGA has taken a dominant stance in this rapidly emerging space, developing relationships with major advertisers and top game developers. When close competitor Massive signed an exclusive relationship with Xbox manufacturer Microsoft earlier this year, IGA became by far the largest independent in-game ad server, in prime position to profit from Sony and Nintendo’s forthcoming new generation of consoles. Soon after founding the company, Herman stepped down as CEO to become senior business development director—a role where he spends more time with his ear to the ground and working with investors. In July of this year, he helped see through a $17 million investment round from Intel Capital, Morgenthaler Ventures, Easton Capital, and DN Capital. www.footagefirm.com Vienna, Va. Age: 21 When Joel Holland was in high school, he advertised a short piece of video he’d shot as an amateur videographer on eBay to see if it’d sell. Someone bit. Holland has since turned his hobby into a $100,000 business that sells professional-grade footage of everything from U.S. landmarks to international locations to erupting volcanoes via a Web site or over the phone. But where competitors might charge $300 to $600 for 15 to 20 seconds of footage, Holland charges $149 for 30 to 60 minutes. His trick? He sells the reels in bulk form, and whatever shooting he can’t do himself, he contracts out to his cadre of 26 professional videographers around the globe. Holland quotes BBC Worldwide numbers, stating that stock footage is estimated to be a $300 million market and is poised to grow to $1 billion by 2010. Even though he founded Footage Firm in 2001 and already counts Disney, ABC, CNN, Discovery, The History Channel, and E! among his clients, Holland has just started working with a consultant at Babson College to develop a strategic plan to grow into a $500,000 company within the next year. www.shopwiki.com New York Age: 25 When he was working at digital advertising company DoubleClick in New York, Eliot Horowitz grew increasingly frustrated trying to find unbiased price comparisons whenever he shopped online. So Horowitz, who studied computer science and artificial intelligence at Brown University, set out to solve the problem. 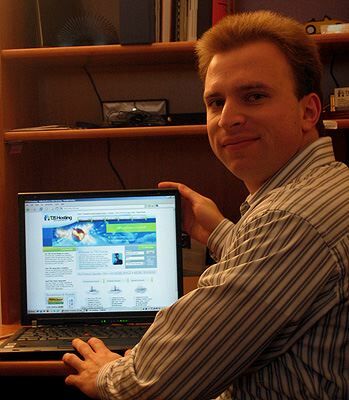 He spent six months building a virtual spider designed to crawl the entire Web to seek out the best price on a product and incorporated his work into his site, which launched in 2005. Unlike traditional search engines and comparison shopping sites, companies can’t pay to place higher in the search. “The goal of the site is to be completely unbiased and completely comprehensive,” says Horowitz. The site, which is written and edited almost entirely by its users, also contains reviews, ratings, and articles on products that range from books by Muslim authors to baseball gloves. The company is not yet profitable, but that’s largely for lack of trying, says Horowitz. “In some ways, [monetizing] is an afterthought. We know it’s very valuable real estate. All the other comparison shopping engines are extremely profitable,” he says. If the user is already in the market to buy, then companies will be extra happy to target their advertising to the search results for their product, reasons Horowitz. The company survived on its own for its first year and a half, then raised $6.2 million in venture capital. Though he needs to make payroll for 25 employees, Horowitz is betting that by continually improving the consumer experience, his site will become a major player in online shopping by 2008.
www.unitedbankcard.com Hampton, N.J. Age: 23 Jared Isaacman put together the plan for United Bank Card, a nationwide transaction processing company, alone in his parents’ basement. The idea, he says, was not really unique. He simply noticed—he was working in IT for a credit-card company at the time—that the big financial institutions ignored the processing end of the credit-card business and focused more on issuing the cards to consumers. The industry was using outdated hardware, and transaction processing and setup times for new business customers were slow. Once he realized he was onto something big, Isaacman recruited close friends and family, who worked 100-hour weeks to build the framework for the company. Instead of thinking about locating venture capital, Isaacman says he took the $10,000 in stocks his grandfather had given as far as he possibly could. That was in 1999. In 2005, the company did $56 million in business and Isaacman says he expects 2006 to be similar. This year, United Bank Card processed more than $5.5 billion in credit-card volume for over 60,000 unique businesses across the country. The company enables a variety of businesses, from restaurants to multilocation retailers, to accept credit-card and other noncash-based payments from their customers. Isaacman says that most people don’t realize that it’s not the banks that do the heavy lifting in the credit-card industry, it’s the processing companies like United Bank Card that kick into gear when a card is swiped at a business. Isaacman’s plans for the future include “selective acquisitions” with the goal of further increasing the company’s market share. www.theculturalconnect.com San Francisco Age: 24 Sumaya Kazi is the co-founder of The CulturalConnect, an online media publishing company with a collection of four interlocking Web sites and e-magazines aimed at spotlighting and connecting young minority professionals with each other and to the nonprofit world: The DesiConnect caters to South Asians, then there’s The AsiaConnect, The MidEastConnect, and The LatinConnect. Each of the sites’ content consists largely of profiles and interviews of young minority professionals who are working corporate and nonprofit jobs. The sites’ most popular feature is “The ConnectionPoint,” a tool that allows the reader to network with featured professionals. Next up? The AfricanaConnect, which will be launched in January, 2007. The CulturalConnect’s staff are all under 30 and work remotely, meaning there’s no office overhead. Though she won’t disclose revenues, Kazi says the site, which had more than 560,000 page views in September and spends no money on advertising, is profitable, relying mainly on banner advertising. And The CulturalConnect venture is just a spare-time gig for her. Kazi’s also the youngest manager in her marketing department at Sun Microsystems. www.fitfuel.com Los Angeles Age: 23 Ever wonder what those vending machines with nothing but soda and junk food are doing at your local gym? Sean Kelly did, and in 2002 he founded Fit Fuel, a health food and vending machine supply business, to tap into what he saw as prime vending real estate. After testing about 500 products from more than 150 brands, Kelly stocked his vending machines with a selection of trail mixes, nutrition bars, energy drinks, and other snacks targeted at athletes. With 10 employees, projected 2006 revenues of $3.5 million, and a new Web site that accounts for 40% of Fit Fuel’s business, Kelly has no complaints about the progress he’s made in his four years of business. His next step is to develop Fit Fuel’s own nutritious product line to sell through the channels he has in place. At only 23, he still gets baffled looks from vending machine industry professionals decades older, but he takes them in stride. www.paragonlake.com Beverly Hills, Calif. Ages: 21 Matt Lauzon and Jason Reuben want to revolutionize the custom jewelry business. Paragon Lake, their Beverly Hills-based online store, offers shoppers the ability to customize pieces of jewelry that are delivered with little wait time—because as soon as an order is placed, the company’s Los Angeles facility is alerted to assign a jeweler to begin handcrafting it using a three-dimensional computer drawing. Lauzon notes that the company only buys materials on an as-needed basis from suppliers located nearby. Lauzon and Reuben raised $200,000 for their venture through an angel investor, with the option of another $500,000 from the same investor provided they hit growth targets. They are so far more interested in enhancing their existing technology and are conserving funds by bootstrapping. Paragon launched in August, 2006, but Lauzon and Reuben already project $3 million in revenues by August, 2007. The two Babson seniors aren’t stopping there. They’re planning to use their existing technology to help independent retail stores streamline their manufacturing processes, starting in March. New York www.extremee.org Ages: 24 It’s a love story with an enterprising twist. A student at NYU’s Steinhardt School of Education studying communications, Sheena Lindahl had been self-sufficient since she was 17 and was putting herself through college. She met Michael Simmons, a business major at the university’s Stern School of Business, who had started his first business at the age of 16, by chance at a nearby coffee shop. They started dating, and launched Extreme Entrepreneurship Education Corporation in their junior year with the goal of helping young people realize the value of pursuing entrepreneurship through education and outreach. To clarify exactly what they wanted to communicate, Lindahl and Simmons spent months interviewing mentors, entrepreneurs, and other successful people, and assembled their findings into a book called “The Student Success Manifesto,” which their company published in 2003. Speaking requests started pouring in. After graduating in 2005, the couple launched the Extreme Entrepreneur Tour, a series of speaking engagements at colleges around the country, where they bring along renowned young entrepreneurs to speak to students about pursuing their passion. www.copperrain.com Provo, Utah Age: 25 Since he was 8 years old, creating elaborate stop-motion movies around his house, Cammon Randle hasn’t been able to put down a camera. In December, 2004, he started CopperRain Productions to make promotions, training videos, and creative shorts for companies of various sizes, including Hitachi DataSystems, Xango, and The Marketing Success Institute. Randle and his wife, Lorri, who brings marketing know-how and business direction to CopperRain, are planning to surpass last year’s revenues of about $50,000 by taking advantage of the Internet to distribute their videos as well as educate potential clients about the company’s services. To learn how to keep up with competitors, Randle attends Provo Labs, a series of entrepreneurial seminars run in his hometown by Paul Allen, the founder of MyFamily.com. www.alumwire.com San Francisco Ages: 22 and 19 Brothers Aaron and Allan Sahagun didn’t set out to build another Facebook when they launched their social networking Web site Alumwire earlier this year. Instead, they created a site that addressed the challenge they were facing in their own lives: the transition from college to the job market. Alumwire aggregates job listings from classifieds partner Careerbuilder.com, and articles pertinent to the graduate set from news partner Dow Jones. In about a month, new features will be added that will give users the option of importing user profiles from Facebook. So far, members-only Alumwire is available to students at more than 1,000 four-year universities but only has about 2,000 total users. While the brothers still focus most of their marketing efforts on the San Francisco and Boston areas—Aaron is a UC-Berkeley graduate and Allan is a Harvard undergraduate—2007 will see Alumwire expanding to several new markets. Aaron is working with the University of California’s office of the president to expand its reach to even more UC campuses, and Allan is working with two British companies to market the site to students and graduates there as well as in Germany and Australia. www.musicane.com Los Angeles Age: 23 Sudhin Shahani was born in India, grew up in London, and earned his entrepreneurship degree at Babson College. Not surprisingly, Shahani’s ventures reflect his worldliness. At 23, he’s already founded two companies—RTG Animate, a Kolkata, India-based business that trains traditional and 3-D computer animators, and MyMPO, a digital media company. Shahani is particularly excited about Musicane, MyMPO’s flagship service, through which any artist can sell his work—audio, video, or ringtone—online. Artists create storefronts for themselves for $20 a month, price their content, and post it for anyone to buy. Musicane processes the transactions through PayPal, taking 20% of each sale. Shahani says he knew he was on to something when R&B singer John Legend signed on to sell individual tracks on Musicane for $.99 each. Besides 30 employees based in New Delhi and Los Angeles, Musicane’s staff roster includes Will.i.am from rap group the Black Eyed Peas, who is serving as head of marketing as well as Bob Jamieson, the head of BMG Canada, who is an advisory board member. Shahani launched the service in beta at the beginning of this year, and it has grown by 45% per month, with 3,500 separate digital stores now up and running on the site. He estimates bringing in more than $600,000 in revenues over the next year. www.telmeclothing.com Ewing, N.J. Age: 25 Kevin Shane wants you to take your clothes off…and turn them inside out. In 2005, Shane walked from one souvenir shop to the next in popular East Coast resort destinations such as Martha’s Vineyard and Nantucket offering up his one-of-a-kind duds: T-shirts with a local map, song, story, or quote printed on and only visible on the inside of the shirt. The novelties were a hit with about 20 of the dozens of shop owners he visited, and a business was born. A graduate of Babson College in entrepreneurial studies, Shane has since expanded Telmé Clothing’s inside-out product line to encompass sports, music, hobbies, and holiday themes as well as custom orders. While the online component of his business is struggling to hit its stride, he is working hard to attract the attention of a large retail store. “When it comes to clothing, unless you sell your product for a huge margin, you have to work in volume,” says Shane. www.volusion.com Simi Valley, Calif. Age: 23 Two years before he graduated from high school, Kevin Sproles founded Volusion, a Web design firm whose three employees operated out of his parents’ house. The company has since evolved into a successful online store builder that has sold e-commerce capabilities to more than 5,000 active businesses, focusing on installation ease and speed. Volusion works to keep shoppers from getting frustrated and recently created a simplified registration and checkout process it trademarked “Fastest Checkout on the Web.” Today, the company has more than 35 employees based out of two offices—one in Simi Valley, Calif. and one in Austin, Tex. Sproles estimates the company will bring in close to $5 million in revenues in 2006. The best part, he says, is that most of it is recurring revenues maintained through a subscription model of around $57 per month and up. Google chose Volusion and other companies to integrate their retailing technology with Google’s new checkout system and help them test and launch it in June of this year. “We weren’t interested [at first], since we were worried they would be competing, but it turned out to be good for both parties,” says Sproles. 23. LeRoy Watkins MyBike Inc. Outdoor advertising is moving into some unusual territories these days, but in August, 2005, LeRoy Watkins thought of one new underserved space: the bicycle. Beginning in Boston’s Northeastern University campus and moving out into the high-commuting neighborhoods of Cambridge and Somerville, Watkins’ business rented brand-name bikes for an unlimited amount of time for a one-time upfront fee of $20 and an agreement to keep a pane of advertising affixed to the bike’s frame, which is checked monthly. Now in its second year of business, MyBike has worked out glitches such as easily removed ads, stolen bikes, and skeptical potential advertisers. Watkins predicts over $100,000 in revenues for 2006, and now considers Boston his “test market,” hoping to ride into three more East Coast cities by 2009, and one West Coast city by 2010. He won’t say specifically where the company will go next, but future bases of operation will have a concentrated commuter area and at least one warm season. Omaha, Neb. Age: 24 During the Web boom in 1999, Fastmusic, a fledgling music company in New York City, hired Jimmy Winter to create its Web site. That experience, combined with his interactions with label representatives he met booking concerts such as Dashboard Confessional at his local club in Omaha, taught Winter what it takes to run a record label. Before long, he noticed an opportunity. Small, independent labels, or at least the ones he worked with, lacked efficient management systems to share information with each other. A lot of small labels have members on the road with bands, or no office at all, so Winter decided to invent a way for them to stay up-to-date in real time. “They were using Filemaker Pro, Excel, even file cabinets,” says Winter. In 2003, Winter launched Music Arsenal, his Web-based management software, with the goal of bringing labels’ management systems into the modern age. For the first two years, Winter built the company in his spare time and only had one client, a small independent. Since going at it full-time last year, Winter has attracted 19 more clients, including Atlantic Records Lifestyle Promotions and renowned indies Light In The Attic and We The People Records. www.livebycampus.com Scottsdale, Ariz. Age: 24 Both of Eric Wu’s sisters are doctors, and he expected to follow in their footsteps, but doing business appealed to him more. At the University of Arizona, he co-founded a job posting site for students called jobdoggy.com, which he flipped for $75,000 within a year and a half. He then borrowed money against his scholarships and bought rental properties around the campus. As the housing market boomed, his equity grew, but Wu had trouble finding tenants. That’s why his LiveByCampus, a property listing Web site for students, was created. If a user signs a lease with a property listed on the site, LiveByCampus pays the user $100 for using the service. Apartment and residential property management groups pay LiveByCampus $195 for each successful lease transaction. To stir up business, Wu hired two people to give presentations at student organizations, advertised on social networking sites, and formed partnerships with area property rental companies. Wu estimates about $50,000 in 2006 revenues and says that by February, 2007, his site will serve seven campuses, starting with Arizona before spreading to Texas, Colorado, and California.